Predictable Cavity. Efficient and Effective Weeps. 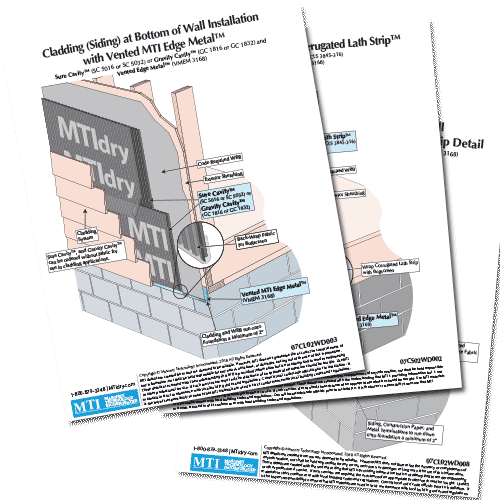 Brick is a "reservoir cladding" because bricks and mortar joints absorb water. It is essential that the brick veneer is allowed to drain and dry across the entire vertical wall. Excess mortar bridging the air space behind the brick compromises the water repellency of the water resistive barrier which leads to rot and failure. Ineffective weeps and poor placement contribute to prolonged moisture exposure, deteriorating masonry joints, and increasing efflorescence. 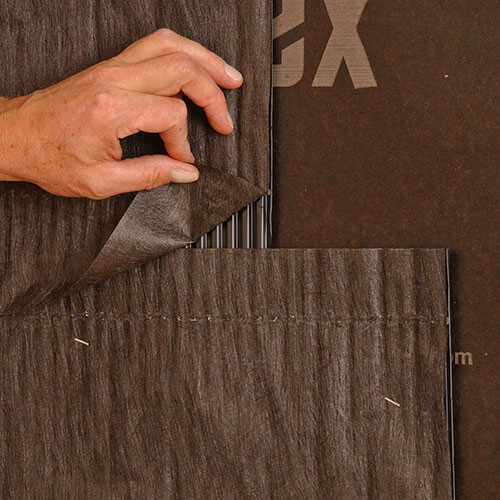 Sure Cavity™ drainage mat's rigid channels and mortar blocking fabric ensure a clear and continuous drainage gap along the entire backup wall. Plus, it is available in a 16" height to fit between brick ties. Rope weeps and tubes don't work, and water doesn't run uphill to drain from cell vents above the bed joint mortar. 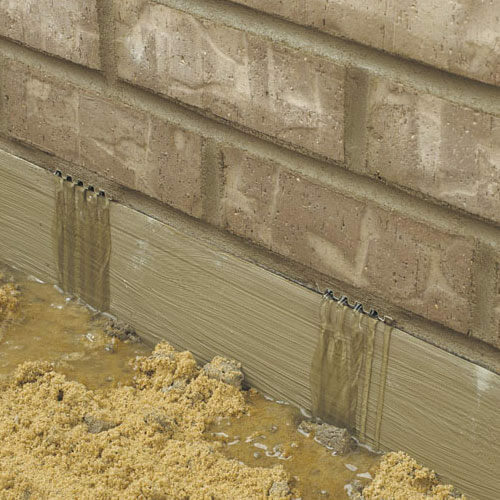 Cavity Weep™ is a self-spaced weep system that quickly rolls out on the flashing and creates drainage tunnels directly on the flashing. 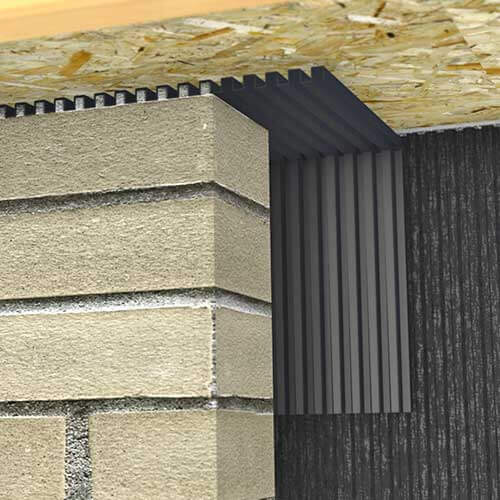 Head Joint Weeps drain water directly on the lintel or shelf angle flashing. Each Head Joint Weep is 3/8" wide - the same as a mortar joint - so it acts as a time-saving spacer for creating great looking mortar joints. Take advantage of physics by letting warm moist air exit at the top of the wall. 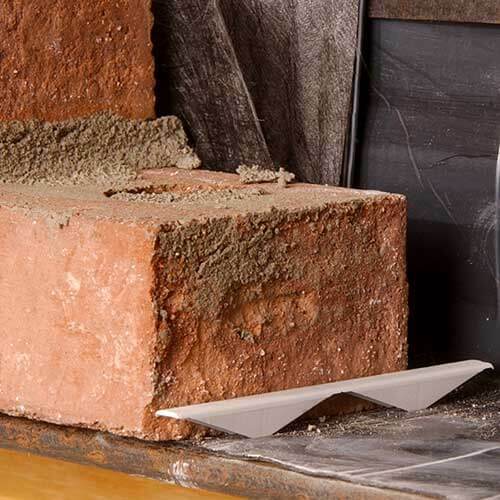 Floor Edging™ maintains a pathway for ventilation from the air cavity to the exterior - simply tuck-point mortar between the top course of brick and Floor Edging, then score the Floor Edging at the face of the wall and snap off the excess.